Set in a quiet neighborhood on the heart of Bar Harbor's popular village, this comfortable home offers much convenience to all that the Island has to offer. You're sure to enjoy being able to walk to the village center for dining or shopping or bike into the park directly from this house, or the nearby public wade pool on those warm summer days! FIRST FLOOR: Living Room with cable TV and sofa.Kitchen and dining room with table for six. we have excellent WIFI AND Living room with cable TV and netflex. 3 Bedrooms, one with a king bed and 2 Bedrooms with queens. OUTDOOR AREA: Pleasant yard protected by tall trees offers lounge chairs and gas grill. AMENITIES: Standard refrigerator and microwave.Air conditioner, Washer/Dryer . Gas Grill. TV and wireless internet. No DVD and no land line so remember to bring your cell phone! I;m local so if you need anything I'm always available. Totally enjoyed our stay...nice house, very well maintained, clean, comfortable...everything you might look for. Would unconditionally recommend this rental to anyone interested in staying close to downtown Bar Harbor. In a great location close to downtown. The house is very clean, would definitely stay there again. We loved the area. There is so much to do in Acadia National Park and the surrounding area. We were there in mid September. The park was not to busy. We spent quite a bit of time hiking. It is to early for the fall colors but we did start to see some of the trees turning. Will definitely return again. My two children (ages 23 and 20), my mother and I stayed at this lovely house for 5 nights. We were within walking distance of the pier, downtown and a grocery store. We had everything we needed. I would strongly recommend this house for a family or group of friends. This house was perfect for our family of 4 during our week in Bar Harbor. Each kid could have their own bedroom, so there was a lot less drama at bedtime. The location is close enough to walk to everything in town and easy to drive into the park or off the island. With the supermarket right across the street, and the well-equipped kitchen, it was convenient to prepare meals at home when we didn't want to go out. Would absolutely stay here again next time we're visiting Acadia. We had never been to Bar Harbor before and had a great visit, hope to return one day. The home was a fantastic location for us. The older kids really liked being able to easily wander around the shops on their own. There’s a grocery store across the street and easy walking distance to all the shops, restaurants, sand bridge, and harbor where most tours seemed to depart from. Our family of 6 fit well in the house, our children are ages 7-16. The master bedroom had a big king bed, then two other bedrooms with doubles or queens not sure which. There’s a full bath upstairs and half downstairs in with a washer and dryer. The house was very clean, bright, cozy, and the kitchen stocked well. There was a nice, small patio out back with a table, chairs, and grill that we enjoyed. I would say that if you have little children and would like some yard space there is no yard at all. But we didn’t mind, we enjoyed the front porch, back patio, or went out venturing. There was plenty to do to keep us busy, so we didn’t miss it. Also, there are no curtains on the windows, just blinds so the rooms get a lot of light, I think sunrise was at 4:59 am😁��. We didn’t We We didn’t mind because it got us up and around bright and early, but I know if our kids had been younger it may have been tough. Overall, we loved the house and felt like it was a great size and location for the 6 of us. There was so much to do in Bar Harbor we feel like we barely got started and it was time to leave! Great ‘Home away from home’ in Bar Harbor! 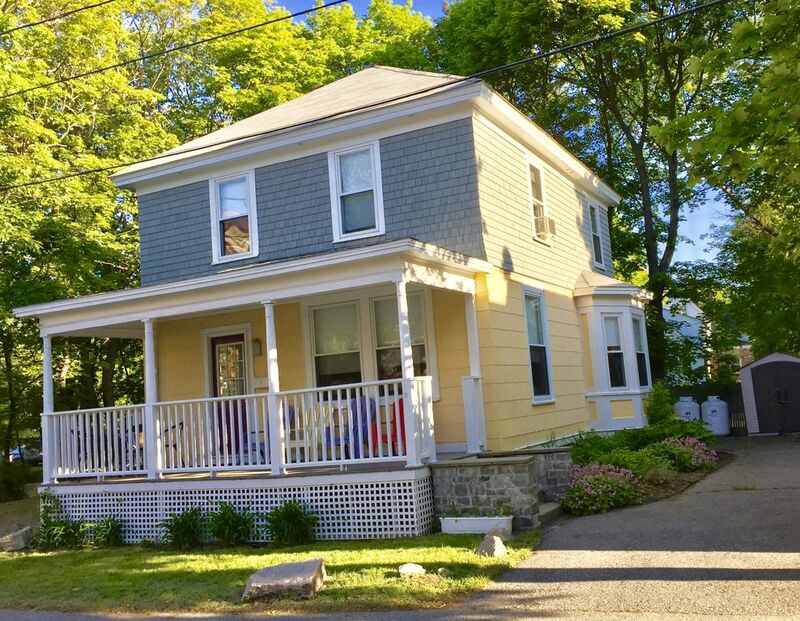 This super charming 3 bedroom home was ideally located in downtown Bar Harbor! Walkable to everything but just far enough away from the Main Street hustle and bustle. Plenty of space for 4 people. We loved relaxing on the front porch every evening. Has everything you need for a ‘home away from home’. Having the grocery store across the street was so convenient. We would definitely recommend this home and we plan to stay here again! Minutes away from Acadia National Park beaches, hiking, biking, golfing, mountain climbing or just sightseeing.